Added cycle.js v6 and v7. What a difference the new version makes! Added inferno.js. This small framework made writing a faster vanillajs version challenging. Updated all frameworks to their current version. New benchmarks: Append 10,000 rows, Remove all Rows, Swap two rows. Added two benchmarks that measure memory consumption directly after loading the page and when 1,000 rows are added to the table. Vanillajs is fastest, but not by much and that only by hard work. 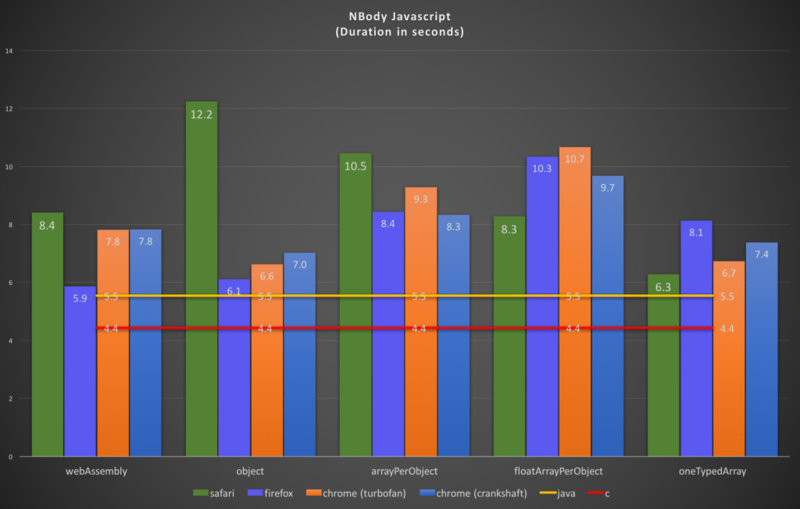 Inferno.js is an incredibly fast framework and only 1.3 times slower than vanillajs, which is simply amazing. plastiq comes in as the second fastest framework being just 1.5 times slower, followed by vidom. Cycle.js v6 was slowest by far, v7 changes that completely and leaves the group of the slow frameworks consisting of ember, mithril and ractive. All source code can be found on my github repository. Contributions are always welcome (ember and aurelia are looking for some loving care, but I to admin that I have no feelings for them. And I’d like to see a version of cycle.js with isolates) . Thanks a lot to Baptiste Augrain for contributing additional tests and frameworks! It turned out that ember performs better with ‘key=”identifier”‘ in the #each helper. Ember got much faster for “partial update” (from 164 msecs to 58 msecs), but is still quite slow for create or update 1000 rows. Preact leaves quite a good impression. It’s a lot faster than react for create 1000 rows and update 1000 rows and not much slower for the rest. Almost the same can be said about react-lite though the performance for “remove row” is rather weak. All in all especially angular 2, vidom and preact impress with their performance. 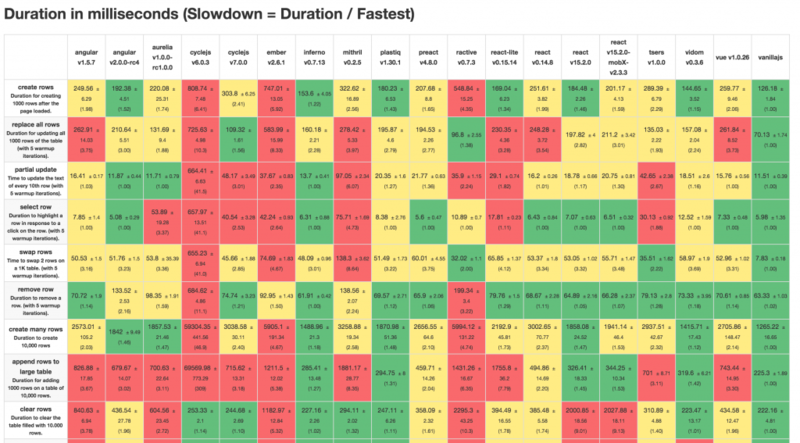 Still aurelia feels much faster in the browser than in the selenium tests (except for startup duration which might be my fault not using the bundler correctly). 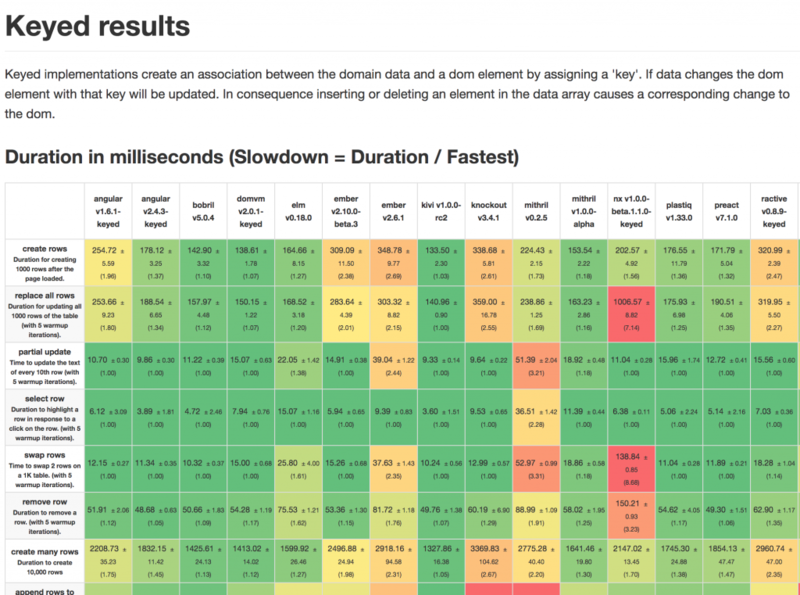 And yes, vue.js is now pretty close to the fastest frameworks. 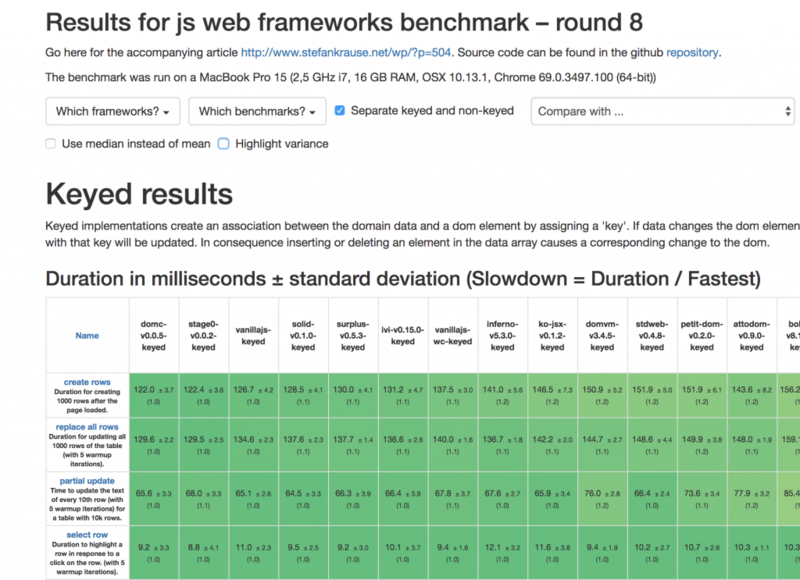 You can view the benchmarks in the browser and find all source code on github.